Usually you embed a YouTube video that links back to Youtube. 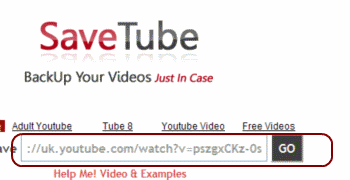 However, it is possible show a YouTube video that has been saved locally in your wiki page. A dialog box will open, make sure save file is checked then press OK. The next step is to upload the FLV file caledonia.flv to the wiki page. 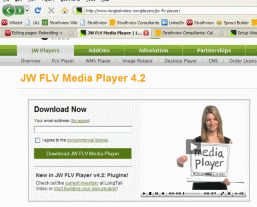 Go to http://www.longtailvideo.com/players/jw-flv-player/ and enter your email address and download the flv player. You then need to put HTML code on your site. Squark has kindly provided this on his site at http://squark.pl/dev:9 and it is also shown below. Copy all of it to your wiki page. (the 9 after the width and height refers to the flash player version and should not be changed). One thing to bear in mind in that when changing the html on your page is that you will need to clear your cache and refresh the page before you see the changes. This is particularly true in Firefox due to the way it handles swf files but might also be a necessary step in IE as well. Need help. I uploaded the files player.swf, swfobject.js to my page and pasted the code below and does not work. 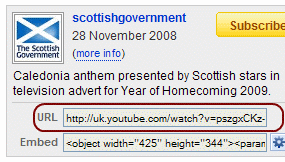 However if you replace the addresses to http://strathviewconsultants.wikidot.com/music:caledonia, works there. What am I doing wrong?